You probably forced e10s on, unfortunately CAA can't run in this mode for now. I'll try to get it work with e10s, but at the moment it's obviously not my top priority. In Waterfox, I have this option, I think because of Tab Mix Plus. 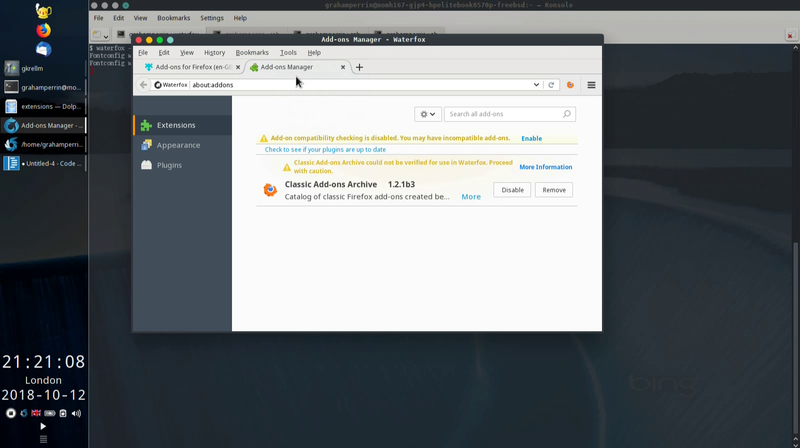 It seems this is Waterfox-specific feature, patches to run CAA in non-e10 window are welcome. As a side note, e10s is enabled by default in Waterfox 56 and not automatically disabled when incompatible extensions are enabled. … patches to run CAA in non-e10 window are welcome. I'd love to contribute but (sorry) no relevant coding skills. @MrAlex94 please: for the next release of Waterfox (56.2.4, I guess) do we need to seek additional help with this issue? That is not a good workaround; please don't share it. Check CAA 1.2.1b1, which tries to run in a non-e10s window. 1.2.1b1 is much better. Hopefully no longer any situation in which the modal dialogue will appear. A special URL e.g. about:… as the first and only tab in the only window when Waterfox starts. reuse the Classic Add-ons Archive button. The problem here is that Waterfox does not restore the non-e10s status of the windows after restart, so they become unsuitable for caa: scheme. This is pretty sad and now I don’t even know if it's worth using non-e10s windows at all or is't better to return the requirement to disable multi-process mode so as not to confuse anyone with the issue after restarting. See also CAA 1.2.1b2 = CAA 1.2.1b1 + warning. 1.2.1b2 feels regressive compared to 1.2.1b1. I could not remember the two-step workaround that I edited out of the foot of (opening post) MrAlex94/Waterfox#755 (comment). I do think so. 1.2.1b1 felt smart and is likely to satisfy a majority of users. I seem to get mixed results with 1.2.1b3. The first impression was good; it was easy to get a window with caa: working. Later use of the same profile was not easy. I could get only the modal dialogue, with its insistence upon disabling multi-process. 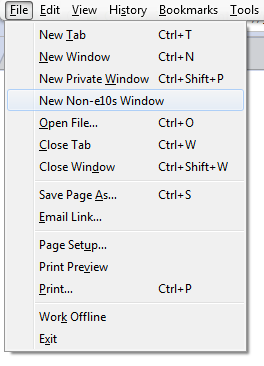 Does 1.2.1b3 lack the (1.2.1b1) ability to automatically open a new non-e10s window? Waterfox in multi-process mode can't restore caa: urls after restart! I could get only the modal dialogue, with its insistence upon disabling multi-process. 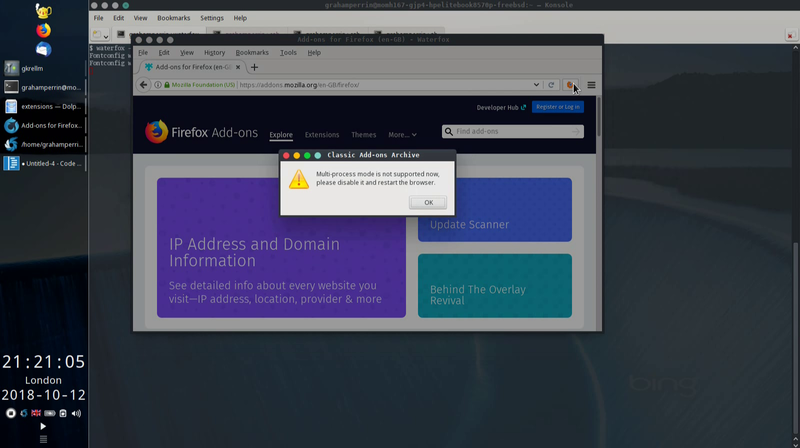 This modal dialog is called from the block if (mode == e10s && appname != "Waterfox"); do you use any extensions or other ways to hide or fake the application name? All 1.2.1bX versions have this ability, they differ in the manner in which the e10s mode is detected and in the presence of a non-modal warning. Sorry, but your wording is too general to be useful for the average user. … do you use any extensions or other ways to hide or fake the application name? I'm testing in a profile that has just the one extension. @grahamperrin, if you can still reproduce the issue with "Multi-process mode is not supported" is displayed, please email me a copy of the test profile where it's observed (you can reduce the size of the profile by excluding the ca-archive, startupCache and cache2 folders from it). Unfortunately (sorry) I didn't set aside a copy of the affected profile before working around the mystery but as seen in the second shot above, it was very clean. PS if it helps to de-mystify: I have a very clear recollection of one of the betas (maybe the first) of 1.2.1 appearing as 1.2.0 at about:addons … I didn't take a shot at the time, I just assumed that you had given a distinctive file name to the .xpi whilst leaving it as 1.2.0 internally. Can't recall which profile was in use when I saw the discrepancy, sorry. I tried, failed, to reproduce the discrepancy. Well … (if we treat the first screenshot in my previous comment as inexplicable) I can not find any situation in which the modal dialogue appears. PS I'm testing primarily with 56.2.3 on FreeBSD-CURRENT, which I expect to be no different from the official 56.2.3 for Linux, for CAA purposes. That's my expectation but for sanity, I'll bring a Kubuntu machine into the mix. This dialogue should never appear in Waterfox, I just don't like to leave inexplicable things unexplained. I'm going to release 1.2.1 tonight to verify the e10s workaround in the wild. Yep, it feels release-ready to me. Wild time. Thanks. Yes, I have the same problem. 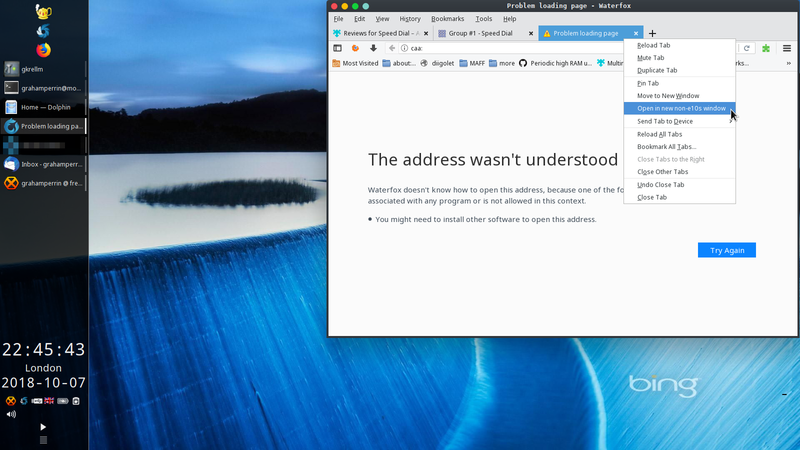 CAA gives a "The address wasn’t understood" message in Waterfox 56.2.8 (64-bit). TMP installed and e10's is enabled. It works if I disable e10s. Just confirming.